This is a big upgrade in terms of there being a serious file system (AFPS) change – a very important change. I have been using this new OS for quite some time on one of my old Macs – maybe 4 different betas). It has been a low impact update and the fact it was able to update successfully my file system is pretty cool. But then again, it had the practice of the in-place upgrade of the file system in 70 million iOS devices to help. While I think that the file system upgrade does complicate this upgrade, this upgrade is minor – meaning a low impact – from the users point of view. This upgrade has significant bugs fixed – see this list of security ones fixed. I was using an encrypted disk (Apple File Vault) and it was still encrypted after I upgraded. Get new AV bits if you use that, possibly uninstall the old version. In my case I use Trend and it was 7.0.1197 and 8.0 was out recently. So I can upgrade now or later. I will chose later and uninstall the old before the upgrade. I can tell you that 7.x does not work in High Sierra based on my work in the beta program. Confirm your tools / apps will work – many or most will have been updated recently – so make sure no outstanding updates. Backup – I suggest you do both an image backup (like using SuperDuper) and the normal file backup such as with Time Machine. 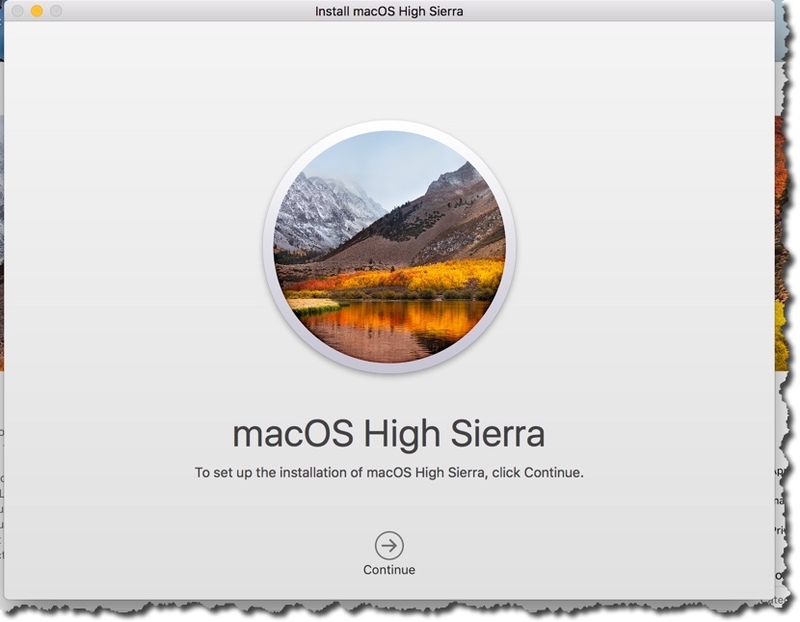 Select macOS High Sierra in the store. Wait for download to occur – slow internet took me 40 minutes. Once the down finishes you see a continue screen. It takes maybe 60 minutes from hitting Continue. Several reboots will occur. At one point it will say less than a minute outstanding but that will turn out to be not true. I heard from a friend that in his three monitor config the progress bar bounces between the three screens. I too have three screens but they are at home and I am not. After it finishes and restarts, you will be asked to log in, and enter your iCloud account password. I now install my new AV. It will install, and try and start and fail. I will need to go into the System Preferences, Security and Privacy and there will be a small alert on the General tab and I will have to select the Allow button. Then Trend works. This will be required for any AV I suspect. Office for Mac 2017, Tweetbot, Skype, Evernote, Slack, 1Password, Skype for Business, Sublime, SecureCRT, Fusion, Chrome, Firefox, Horizon View, BusyContacts, BusyCal, Duet, and OmniGraffle. All of these were the latest versions. The fact these all worked is not surprising but nevertheless nice to know. As well I confirm that my disk is still encrypted by checking in the System Preferences. And it is still encrypted so that is good too! If you want to learn more about encrypting your macOS drive check out this article. I do recommend each and everyone of you do that. It works great. When to Upgrade – http://tidbits.com/article/17497 – I think for many the answer is now. My upgrade was very smooth and I think yours will be too. But have backups just in case. After upgrading have you experienced slowness and or freezing? I have. After upgrading switching from user to user is much degraded and I’ve also experienced several app freezes (Mail, Safari (funny that it actually froze for several seconds when I typed Safari while using Safari) and others. Right now I’d love to revert back to the previous version! I have been using High Sierra for a while. 3 or 4 builds of beta, and then the GA on the day it released. I have not seen what you describe in the GA. I did see a little of it in the early beta but not since. I do not switch users however and maybe that is the trigger. Try not switching users for a bit and see what happens. And you can revert if you want. I suggest you stop user switching, reboot and see what happens. I also suggest you talk to Apple support. I have a MBP and a MBA both on High Sierra with none of what you mention. I have only done 2 machines worth of upgrades. One I had a similar issues to you, but I just restated the machine, started the upgrade and it all worked fine. On the other machine it was an upgrade with no issues. So all ended well for me, and I hope it ended well for you. High Sierra is not much of an upgrade on the surface but it is very big under the surface and I think we will see a lot of new features in the future – all thanks to High Sierra. I had to change the way I do my over-the?network backups, but otherwise it has been fine. I also have decided not to upgrade to High Sierra on some of my computers for a moment.